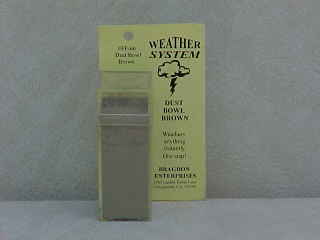 The Bragdon WEATHER SYSTEM instant rust and weather for model aging. 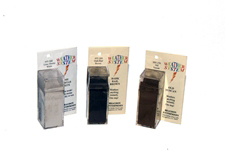 This weathering powder will adhere to any non-glossy surface. It is NOT chalk. One quick step gives a very realistic rusty, dusty or sooty surface - instantly. No drying or curing is necessary. Use sparingly; a little goes a long way. This product is made from real rust and other weathering agents that have been ball milled to a particle size over 100 times finer than chalk and blended with a pressure sensitive, dry adhesive. Self adhesive to most surfaces. Nonmagnetic and Nontoxic.